Multikuf system-ultra compact multikuf system designed to suit virtually any diagnostic situation. features adc’s revolutionary palm manometer with robust linear movement, selection of navy cuffs equipped with leur slip connectors in a compact, multipocket carry case. choose from 3 or 4 cuff models. 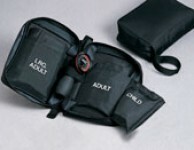 3 cuff includes adult, child, and large adult systems. 4 cuff system adds infant cuff. lifetime calibration warranty. 2 year on system. assembled in usa.multikuf, 4 cuff system, black.